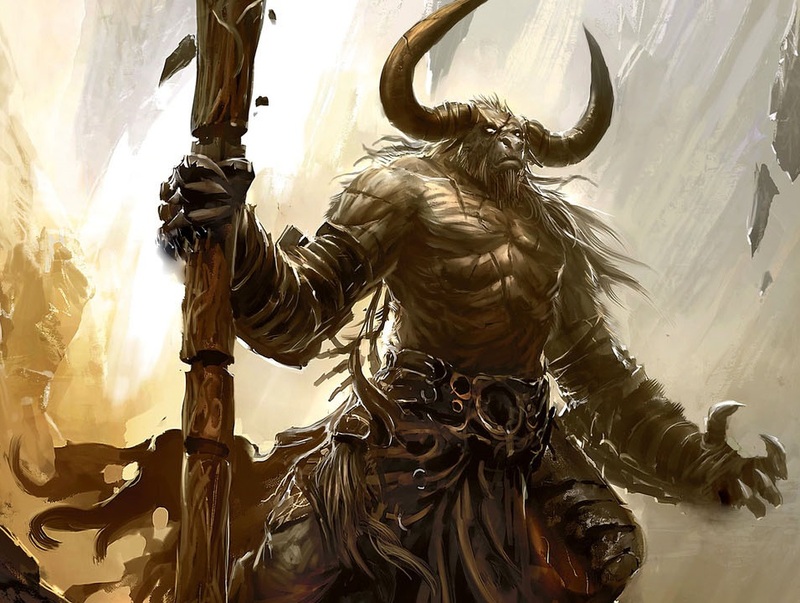 Baal’gor is one of a small number of desert Druids that wander the wastelands never staying in one place for long and never willing to leave the wastelands. A Minotaur of the Etrinan Tribe and one of the few surviving council members. Due to his wanderings he was not present during the massacre of his tribe. Having tracked and found the survivors among the Serinan Tribe, As’gharjan or (“Twiggyleaf” in the Elven and “Small Tree” Western Trade Tongue) has joined the new tribe formed from the merger with the Serelan Minotaurs as a councilor, only the elders know how to find him. His name like most Etrinan Minotaurs comes from the rune weapon he possesses. In his hands it is but a cane or very short staff but in a smaller creatures hands this 5 foot rune weapon is nearly unique as it is made of petrified wood! Among the powers known about the runestaff is that it predates the Elf-Dwarf War and the New Kingdom of the Elves! It has never been confirmed that it was once a part of the Millennium Tree rumored to be in the east. Even more cryptic is the runestaff remembers every wielder and has only 67 names, but some of those names date back to the War of the Gods! It is said ones lifespan is increase twentyfold! It can produce a seed of an almond tree every ten years that can grow in ANY environment! The trees are unique that they never grown above 5 feet and might explain the shortened height of almond trees in the Baalgor Mountains. Currently, As’gharjan (he only allows tribemates to use his first name which he took for the land he swore to guard) is reportedly roughly 7,000 years old and inherited the staff from the previous wielder that did not survive long after the Elf-Dwarf War. Picture from 10steps.sg, edited by AZ_RUNE.